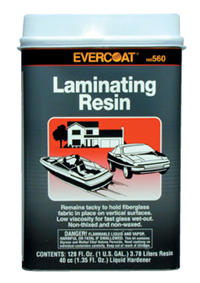 Quality laminating resin for base coat applications. This resin is not a finish coat. This air-inhibited resin remains tacky to hold fiberglass fabric in place on vertical surfaces. Does not require sanding between coats. Excellent for saturating fiberglass fabrics. Liquid hardener is included.